The Digit-al Dozen DOES Childhood, Day 3: LEGOS! Good afternoon, readers! Today is the third day of Childhood Week with The Digit-al Dozen. I have already covered a favorite tv show and a favorite book, so today I’m sharing a favorite toy: LEGOS! Who hasn’t played with these before? My kids love them and I enjoy playing with them now almost as much as I did as a kid. 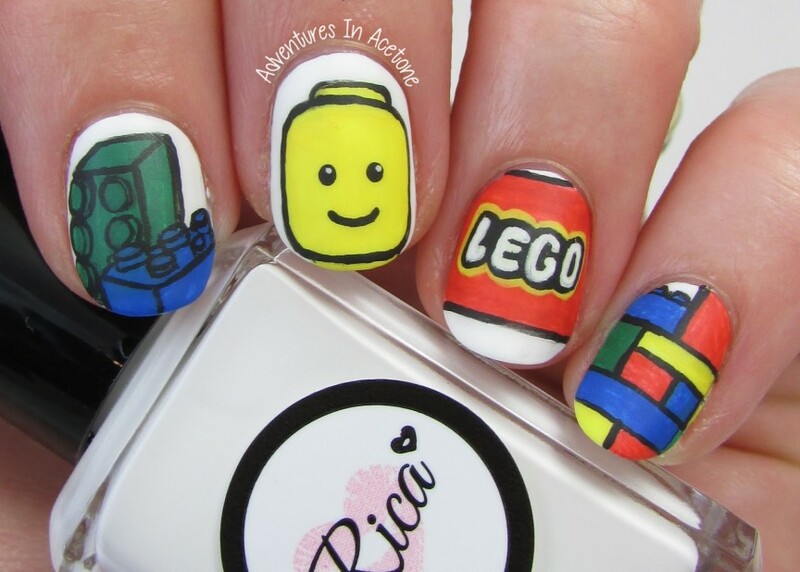 For this mani, I’ve just done classic LEGO things: loose LEGOS (don’t step on those! ), a LEGO character, the LEGO logo, and stacked LEGOS. I started out with 2 coats of Rica Whiteout and let dry. Then, I tried out my new acrylic craft paints again for the detail work using Pure Color Glamor No.1 nail art detail brush. I topped the design with one coat of KBShimmer Clearly On Top, followed by one coat of a matte top coat by Wet n Wild. What do you think? I am still liking the use of acrylic paint, the white and black being my favorite change. I’m still on the fence about the opacity of the other colors compared to polish, though. I may have to reach for my favorite creme polishes for future manis and stick to using white and black paint. Guess we will see! Thanks so much for reading, come back tomorrow for another Childhood Week mani! I freaking love the Lego head! I've been experimenting with acrylic paint too, and had such a hard time cleaning up my skin! Lego is great if you're a kid and annoying as a parent….those little pieces never seem to get back into the bucket and usually end up all over the house…or bottom of the toy chest….or maybe that was just my kids! These are cute! I love the realism of the design on your index finger! This is beyond adorable! I love this! I love it all, but that FACE! This is so cute…might have to steal it!